From the guys who brought to you Siri welcome bRIGHT – a new human-machine interactive technology that will help professionals control even the most complex systems from a unified hybrid display-sensor array. SRI International is a nonprofit research institute headquartered in California established SRI in 1946 as a center of innovation and is now one of the largest contract research institutes in the world. A quick look at the amazing track record of SRI in helping to create new technologies (and new companies with innovative technologies) shows you what a powerful pioneering culture exist in SRI. For example Siri (now owned by Apple), Symantec (the security giant), Verbatim Corporation and Nuance Communications where all related to SRI in one form or another. One of the latest projects of SRI is bRIGHT. The bRIGHT system is a new human machine interface which was developed initially to make complex and time consuming tasks simpler by allowing for a smart interface to take some of the pressure of the user, helping him or her to learn how to control elaborate systems quickly, reduce critical errors and reduce the user cognitively load. All these advantages are extremely important for data-intensive jobs such emergency response operators and network security managers. These tasks can include monitoring vast amounts of information in real time. Having a system which is easy to use, fast but still powerful enough to process and display both specific and more broad information in real time can literally mean the difference between life or death in some cases and the difference between a severe security breach and a protected network on others. 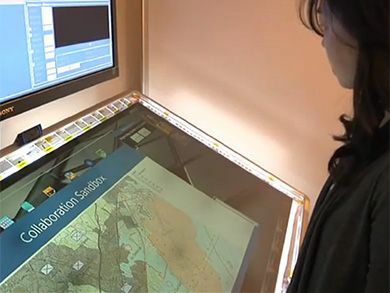 The system is comprised of a multi touch display which can recognize specific individuals on the fly, a number of sensors including cameras which can monitor a person’s face, gaze and other characteristics and using advanced algorithms adept the actions presented on the display (so for example an incoming massage can appear on the display but if the user looks at it and decides to ignore it (as determined by the system), the massage will simply go away. bRIGHT is still in development but it already seem to have a very bright future and SRI is working on taking the system to a whole new level by combining a dynamic control surface (see video below) which can change shape according to the required use (so for example a regular screen can have a pop up tactile keyboard which will disappear when not in need). More information on bRIGHT can be found on the dedicated SRI website.